Have you see a website that surf on it without click? Use keyboard? or Audio? No, it still uses mouse but no click. Don't Click is this kind site, it based on flash, no button needed. You still need move your mouse to right place it shows you its pages. It is really cool, I have never see that before. I am really like this design. 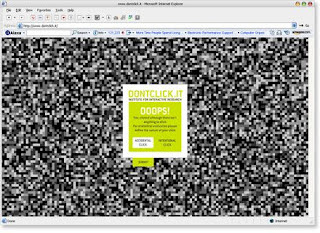 If you clicked by accident, it shows you "oooops" with a black & white pixels window. Does not matter what content is, just look at its design. Pretty cool!